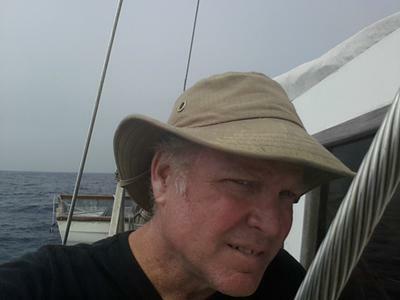 Hi Folks, After falling victim to the 2008 to 2012 GEC we dreamt about finding a boat to fix up and sail to New Zealand, Where my wife Deborah is from. My 2 boys are 13 and 15, they are good boys but somewhat apartment bound. Being in Southern California we used to surf and go for drives up and down the coast. But demands of work meant way more hours for less than it takes to get by and we lost our vehicles. 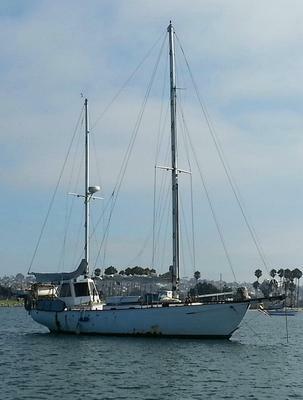 I was barely keeping it together when we found the sailing vessel called "Salvation". In saving "Salvation" we'll save ourselves and find our passion for life again. Los Angeles is an isolating town when you're doing well but little or no community when you loose. 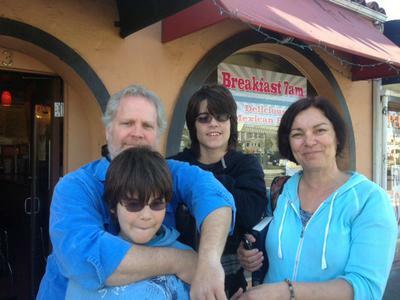 My wife Deborah wanted to go to New Zealand, being one of 10 kids she has a big family for our boys to plug into. But, I thought I'd do well and we'd be able to get back and forth. My career driven choice hurt Deborah more than I could've foreseen or ever make up for. While I was loosing our kitchen design business, she lost so much more...we lost a young dear brother-in-law, father of 2, then a sister, a most remarkable eldest brother and finally Debbie's mum...and I didn't have the means to get her home and back. "Salvation" had been neglected by the last owners a step brother and an ex-wife as they fought the value over what they thought was dollars sign...and it was worth something until you neglect it for 5-6 years. 'Salvo' had a good complement of gear aboard and a generous space to work with. Over the last year and a half I have been contending with everything from the loss of the propeller (while docking), termites, wood rot, badly designed modifications, corrosion to contacts...corrosion in general...all the things you might expect with a neglected wooden boat. I am a tradesman and a designer and I believe in this boat. Then there are the unexpected, the local Southern Californian authorities attitudes to cruisers, over regulated and mean spirited. While I would agree about the vagrant issue, I don't agree on the response. It was a bad day when the ballast/keel broke away. The vessel is certainly more tender but, has handled admirably having lost that 5 ton. I've sailed her from Southern Cal all the way down and around up here to La Paz in search of a boatyard that might be affordable and accommodating to our plight. They say many hands make light work...well, I or we are looking for one or 2 others to share in the preparation and the journey to New Zealand. We will spend about 3 to 6 months in repairs, maintenance and renovation here in the Sea of Cortez and would like help with that. After which, we'll do our "Shake Down" exploring the natural beauty of this amazing waterway and then set sail for the Marquesas from Cabo San Lucas. We'll spend about a year making our way to New Zealand. I've done this before in the mid eighties to the early nineties. I am an experienced navigator, sailor...waterman and look forward to your participation and influence for this undertaking. Replacing that 5 tons of keel is going to be a major expense and drama (and very necessary I would have thought if you intend on sailing her). Maybe you have a cheep source of lead, or can scounge it off dead boats. Maybe even make a up a concrete one with lots of window sash weights in it? It would be bigger though and would need hull mods to fit it. I have basic carpentry skills and time but no savings. I know a little spanish and I have been sailing a total of three times on a chrysler 22. I am sick of Arkansas and I hate cold weather, I don't get seasick that I know of, I did go out on the gulf once for 11 hours on a 26 foot fishing boat and it was a lot different from sailing on a lake but really enjoyed it. I Will Give You my Little Ship! Just made an offer on a similar boat. It’s too bad you’re not in BC, there are lots of boat yards that still take in just wood boats. One of these yards is all about the public and being able to watch a project from start to finish. I myself have donated wood to a boater or made a new wet exhaust unit from scratch for less than half the coast of one off the shelf, plus installation. But to take on a forty foot boat and take it off shore I would refasten her from one end to the other. The time you take will only make your trip a life time enjoyable trip the boys can talk about. Wish you luck and would love to see the house work matched up to the hull.